Yahagi is a great example of how a cruiser, though still with all the vulnerabilities of the type, can become a worth-while purchase. 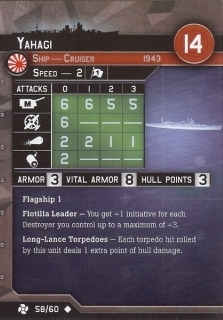 Yahagi's main function is to use the Flotilla Leader SA to help win initiative, allowing your side to move second. This is especially important in torpedo-swarm type builds, at which Japan excels, because it allows your torpedo carrying vessels to choose the range at which they engage. Since these builds will contain enough destroyers to provide the full boost to initiative anyway, Yahagi is an outstanding addition. Yahagi even has some Long Lances of her own as well as a small ASW rating which can assist in at least harassing enemy submarines. Yahagi does a little bit of everything, little bit of long lance, little bit of flag, little bit of asw, nice SA and a reasonable cost. You could find a place in most fleets for this. I recommend keeping her back though, as she is too good a target and she wont stand up to any big guns..